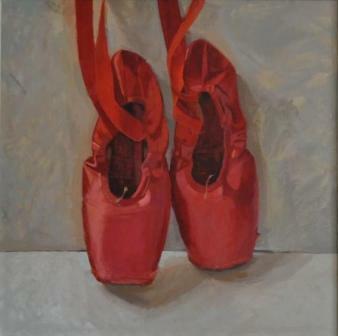 The inspiration for this wonderful oil painting started when Helen Wilson was asked to participate in a fund raising campaign for a dance charity. Helen produced a series of paintings which have now all sold. However, she kept this remaining piece for her own art collection. The painting was completed when Darcy Bussell retired from the Royal Ballet. It seemed to Helen Wilson "that they were pretty big shoes to fill". Helen Wilson art work is now in many private and public art collections. In addition to Red Rag Modern Art Gallery Helen Wilson has exhibited at a number of other Modern Art Galleries. Each painting at Red Rag is sourced from the Helen Wilson artist studio and like all Red Rag Modern art it can be shipped worldwide.